The IDF began a reprisal against Hamas in the Gaza Strip following the early morning rocket attack that struck a home deep inside Israel, injuring seven. 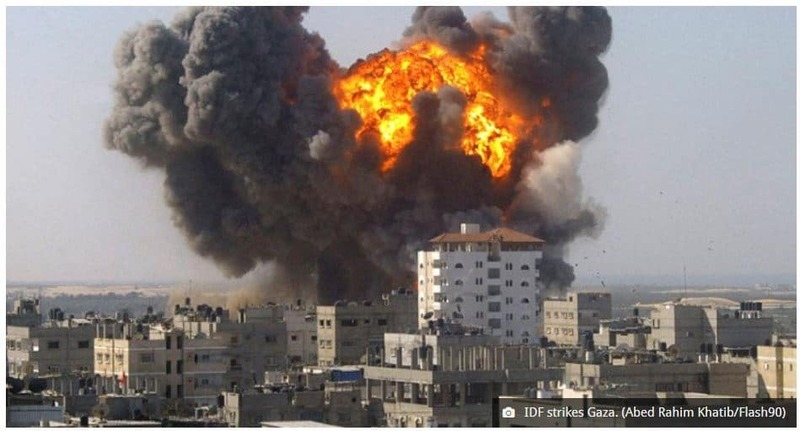 The Israeli Defense Forces have started attacking Hamas terror targets in the Gaza Strip on Monday. “At this hour the IDF is beginning to attack terror targets belonging to the Hamas terror organization along the entire length of the Gaza Strip,” the IDF Spokesman’s Office said. Earlier in the day, Israel moved two Army brigades to the Gaza border. The IDF also announced a limited call-up of reserves. The IDF also instructed Israeli farmers near the Gaza border to leave their fields on Monday afternoon. After-school programs in towns and cities near the border were canceled. The IDF attack is a response to an early morning rocket strike from the Gaza Strip struck a house in central Israel on Monday, wounding seven people, including an infant. IDF spokesman Brig. Gen. Ronen Manelis, responding to questions about why Israel’s Iron Dome defense system hadn’t stopped the rocket, said that no Iron Dome battery was deployed in the area. The Iron Dome system is designed to intercept and destroy short-range rockets and artillery shells fired from distances of 4 kilometers (2.5 miles) to 70 kilometers (43 miles) away. Israel reportedly hopes to increase the range of Iron Dome’s intercept capability to 250 kilometers (155 miles). Prime Minister Benjamin Netanyahu, who is currently in Washington, announced he was cutting his trip short and canceling his Tuesday speech to the AIPAC Policy Conference in order to return and oversee Israel’s response.